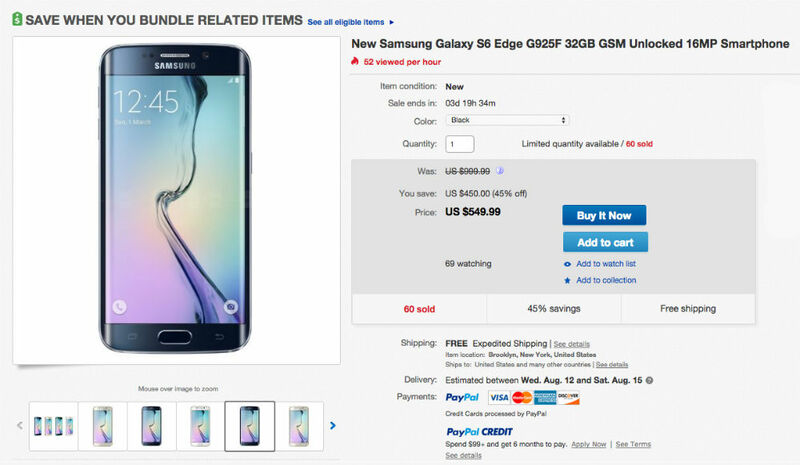 Over on eBay, you can purchase a new unlocked Galaxy S6 Edge 32GB model in Black Sapphire for just $550. eBay lists this as being $450 off its retail value, but that is not exactly correct. On T-Mobile you can purchase this same device for $680 or on AT&T for $815. Regardless, you are still saving money on a great device. Included with the price is free shipping, on top of the unused, unopened device. This is not factory or manufacturer refurbished. The GSM unlocked nature of this phone will allow you to connect to most or any GSM carriers in the US. This includes T-Mobile, AT&T, metroPCS, Net10, and Ultra Mobile. When reviewing the Galaxy S6 Edge, we came away insanely impressed with the phone’s display and camera, but wish it featured a bit more thickness so as to allow for a larger battery. If interested, go grab it before they are all gone.